In January of this year TaxiPoint reported that both Islington and Hackney councils would be looking to ban motorists who drive petrol or diesel vehicles from a new "Green" zone within the Shoreditch area. It has now been revealed that the new "Green" zone will go live on 3rd September 2018, with the operational hours being Monday to Friday, 7am-10am and 4pm-7pm. All petrol and diesel vehicles will be excluded, including licensed London taxis. The exceptions to the exclusion will be all electric and hybrid vehicles, which includes the LEVC TXE taxi. The fine for venturing into the "Green" zone during prescribed hours will be £130. A similar scheme is to be launched by the City of London Corporation in April, which will reduce access to Moor Lane, again only fully electric or hybrid vehicles will be allowed access. The course of action being taken by Islington and Hackney councils as well as the impending action from the City of London Corporation has highlighted a rather interesting and potentially serious situation for the London taxi industry. Nobody from any of the aforementioned councils seem to have given the first thought as to how this affects legislation surrounding both hackney carriage legislation and disability discrimination legislation. According to hackney carriage legislation, a taxi driver must, unless there is a reasonable excuse, take a customer within a twelve mile radius or one hour journey time of their pick-up point. This is a simple enough piece of legislation, until you factor into the equation the new "Green" zone. Islington and Hackney councils now expect a customer to differentiate between a zero emission capable taxi and a diesel taxi. This is all fine and dandy until you realise that around 2% of the entire fleet are zero emission capable, and at the moment, it will take around fourteen years for every taxi to be zero emission capable. This therefore means that a driver could potentially be prosecuted, or have his or her licence suspended or revoked if they refuse to take a customer where they wish to go to or refuse to enter the "Green" zone. Next we come to the next major issue, the disabled community. If a driver refuses or is unable to allow a disabled customer to alight within the "Green" zone, the driver can again potentially be prosecuted. Refusing to take a disabled customer on the aforementioned grounds could also see the driver prosecuted. What also hasn't been factored in whatsoever is the fact that a wheelchair user may need collecting from the "Green" zone. When you consider that the London taxi industry is the only fully wheelchair compliant, door to door service available to the disabled, this scenario beggars belief. The taxi industry, as confirmed by Mayor Sadiq Khan, is part of the public transport industry and is the only door to door service.The private hire industry, by very definition is not part of the public transport industry, it is, as the name suggests, private transportaion. This therefore means that out of all of the vehicles wich could need access to the "Green" zone, London taxis should be top of that list and should as a consequence have an exemption, regardless of the type of engine the vehicle possesses. The streets that will be restricted are fairly inconsequential, they aren't major thoroghfares, in fact some of them you would be hard-pressed to drive along, Cowper Street is a blocked turning and Ravey Street has been partially closed for what seems like years due to building work. 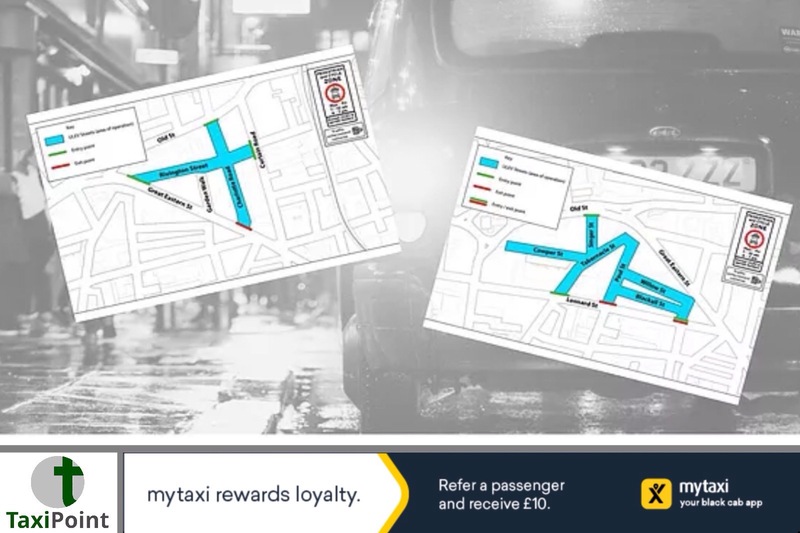 In fact only Tabernacle Street, Paul Street and Willow Street hold any significance, with the latter being the site of a major hotel, this hotel will become inaccessible if taxis cannot drive into Willow Street. This therefore begs the question as to why these streets are REALLY being closed. Any pollution in the area will be coming from City Road, Old Street and Great Eastern Street, none of the roads being restricted have any real weight of traffic. Could it be that "you smoke, I choke" is being used as an excuse to perform an experiment, with a view to expanding the scheme across roads that really are a major pollution problem, but which are also main thoroughfares? So which of the three pieces of legislation should a taxi driver break, Islington and Hackney's emissions regulation, Transport for London's Hackney Carriage Act, or the Governments Disability Discrimination Act. Whatever the answer is, this one requires the wisdom of Solomon as well as a large helping of common sense.